No Christian pilgrim should go to the Holy Land without this scriptural reference tour guide. Each biblical site is given its chapter and verse from the Hebrew and New Testaments with a short description about the location. A special section is dedicated to the Via Delorosa and The Ark of the Covenant. 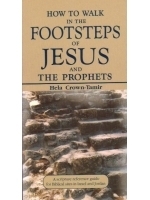 How to Walk in the Footsteps of Jesus and the Prophets is essential item to anyone traveling to the Promised Land. The purpose of this book is to enable the reader to look up a biblical site quickly in its alphabetical form, read the biblical references, and travel to the site from most major cities in Israel and Jordan. These Biblical sites are both ancient and present sites in Israel and Jordan, with a few in Egypts Sinai Peninsula. The purpose of this book is to enable the reader, my fellow guides and the travelers to walk, visit and explore these sites today. The explanations are short and concise. The sites are the birthplaces, homes, Biblical and historical places named in the Bible, in both the Old and New Testament. They are sites from the time of Abraham 2200 BC until the time of Jesus of Nazareth 4BC,30AD, including the early church and Mishnah period, up until the second century. This book will enable one to look up the site quickly in its alphabetical form, read the Biblical references, and travel to the site from most major cities in Israel and Jordan. The section named Specific Sites where Jesus walked is after the main entries. I invite the reader to explore the Land of the Bible in connection with its Biblical history, and I use the name Prophet on the title page to include the Patriarchs, Abraham, Isaac, Jacob and their families and descendants who are mentioned specifically in the Bible. It also includes all those who were divinely inspired and honored and called Prophets in the Bible. You will walk in the modern and ancient sites as these forefathers of Biblical history did.